Can we make a DTP project "public" without having to manually add a team or individual user? In our desired environment, anyone with an LDAP account should be allowed to view the reports in a DTP project. We understand that there may be some security implications with this approach, but we also do not want to manually upkeep custom team/LDAP groups anytime there is a new user. our main primary focus project structure since most of the times you don't want every person to have access to a Project, but in your situation is the opposite you do want everybody to have access to everything in DTP, and you are correct we don't have that BitBucket flexibility. Hi @ByronPhung it's possible but as you stated security will be in the way, and also if you don't create a special group all users from LDAP must be imported to DTP which can cause slow performance base in your LDAP users total, so in other words is possible can bring performance/security issues to the table. Thank you for the quick response, @Jromero! I definitely understand the concern with that. I should also mention that we already have LDAP connected to our DTP server, so any user with a domain account can already login to our server and we are not maintaining any additional accounts separately in DTP. All we are looking for is a way to allow users to view reports generated from a different machine, such as in a Jenkins build, for example, without having to add a "team" or "individual user" to the project directly, similar to how BitBucket offers a "Make repository public" option. Given your response, does that mean the answer is no? @Jromero Thanks for the confirmation. In that case, unless that option is offered in a future release, we will then have to consider an alternative approach or a different workflow. You can give a users (or group of users) access to all the filters/projects in Report Center by using a 'permissions' in User Administration. Under User Administration, search the Groups for the group that you are using to manage the users. 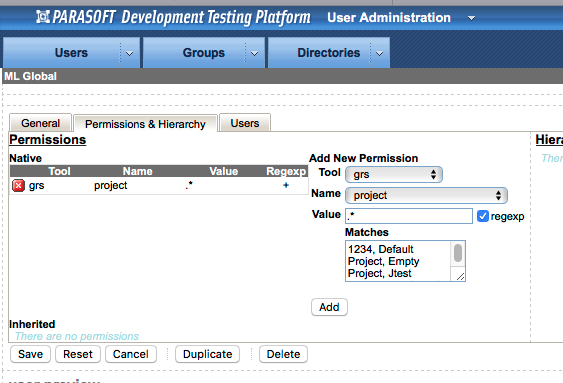 Select the 'Permissions & Hierarchy' tab. See Documentation: "Parasoft DTP 5.3.2 > Administration > User Administration > Assigning Native Permissions"
@Mark Lambert Thank you for the response, Mark! This is good information to know in case we want to isolate permissions by user or group. However, we are currently looking into applying permissions at a project-level, not user or group level. The method described above would require us to manually create a DTP Team, then add users to that team, and finally add that team to our desired project for the permissions to apply whereas we want to manage permissions per project, which would apply to all users by default.